Clayton Crockett’s Deleuze Beyond Badiou is more than a commentary on Badiou’s reading of Deleuze or a defense of Deleuze. It is, rather, a transdisciplinary work that crosses the domains of theology, philosophy, and politics through a reading of the relationship between Deleuze and Badiou. Crockett’s goal, however, is not primarily descriptive but constructive, in that he uses the relationship between the two philosophers as a means for thinking otherwise. 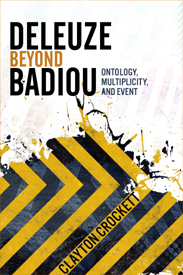 [Hollis Phelps, author of Alain Badiou: Between Theology and Anti-Theology and Assistant Professor of Religion at Mount Olive College, reviews Clayton Crockett’s Deleuze Beyond Badiou: Ontology, Multiplicity, and Event (New York: Columbia University Press, 2013)]. Clayton Crockett’s Deleuze Beyond Badiou is more than a commentary on Badiou’s reading of Deleuze or a defense of Deleuze. It is, rather, a transdisciplinary work that crosses the domains of theology, philosophy, and politics through a reading of the relationship between Deleuze and Badiou. Crockett’s goal, however, is not primarily descriptive but constructive, in that he uses the relationship between the two philosophers as a means for thinking otherwise. Deleuze Beyond Badiou is, in this sense, perhaps best read as a theological-political mobilization of Deleuze, a mobilization against Badiou but also beyond Deleuze himself. The first two chapters are largely introductory in nature. Chapter 1 situates both Badiou and Deleuze within their broader cultural and philosophical contexts, while Chapter 2 stages the initial confrontation between the two philosophers, as it is set out by Badiou himself in Deleuze: The Clamor of Being. On Crockett’s reading, Badiou “offers a fixed, frozen representation of Deleuze to his readers” (12). Badiou’s Deleuze is “an austere, ascetic, and aristocratic Deleuze, who pursues his rigorous philosophy in ironic solitude completely apart from the turbulence of history” (12). Crockett notes that this image, however, is the result of a selective reading of Deleuze, a reading that allows Badiou to misread and mischaracterize Deleuze as a philosopher of the One. Much of the rest of Crockett’s book is devoted to correcting this image, though not through a simple, exegetical defense of Deleuze. That is, in the chapters that follow, Crockett uses Badiou’s (mis)reading of Deleuze to construct an original, coherent reading of Deleuze against Badiou but also, in a sense, beyond Deleuze. Crockett’s reading of Deleuze takes up Chapters 3 – 5. Chapter 3 provides a pointed reading of Deleuze’s Difference and Repetition. Deleuze’s goal in Difference and Repetition is to think difference itself, that is, difference as it is without recourse to various media of representation (e.g., identity, analogy, opposition, resemblance). For Crockett, however, the crucial concept in this difficult work is not so much difference but repetition: the liberation of difference from representation frees thought to think repetition in itself, repetition thought as the intensive iteration of difference instead of the same. The ontology of repetition that Crockett develops from Difference and Repetition serves to ground his reading of The Logic of Sense in Chapter 4. Crockett reads The Logic of Sense as an epistemological repetition of Difference and Repetition. That is, the work done by intensity to produce the repetition of difference in Difference and Repetition is done by the event in The Logic of Sense but from the perspective of sense and language. The event—or, perhaps it is more accurate to say, being as event—takes place as a cut in becoming through a logic of double articulation, “an articulation of corporeal body and noncorporeal sense” (63). The logic of double articulation, which Crockett argues is further complicated and intensified in Deleuze and Guattari’s A Thousand Plateaus, allows us to understand the event as “a singularity that transforms the potential energy of body into the actualization of language in the production of sense” (61). Chapter 5 follows the development of this notion of the event in Deleuze’s later works, specifically Anti-Oedipus, The Fold, and Cinema 2. Most important for Crockett is Deleuze’s image of the time-image from Cinema 2, which Crockett takes as “the revolutionary concept of Deleuze’s later philosophy” (93). In a less-than-sympathetic review of Deleuze Beyond Badiou in Notre Dame Philosophical Reviews, Jon Roffe, author of Badiou’s Deleuze, chastises Crockett for adopting an “explicitly falsifying method” and of engaging in “deliberate falsification.” As Roffe states, “One might appreciate Crockett’s antipathy towards Badiou’s project in general, and his reading of Deleuze in particular, but it is truly depressing to see a genuine philosopher’s work treated so poorly.” Although, like Roffe, I take issue with particular aspects of Crockett’s reading of Badiou, it does not seem to me that Crockett is engaged in “deliberate falsification.” He is, rather, doing to Badiou the same thing that Badiou does to Deleuze. More specifically, just as Badiou creates a “frozen image” (12) of Deleuze as a means of asserting his own position over against Deleuze, Crockett creates an equally frozen image of Badiou as a means of asserting Deleuze over against Badiou. The move allows Crockett to release the dynamism at the heart of Deleuze’s project, which in turn provides the fodder for Crockett’s own more constructive proposals in Chapters 8, 9, and 10. We may lament the strategy, but in many ways this is just one way that philosophy works, though we often don’t like to acknowledge as much. This is because philosophy is not a neutral domain but, as Deleuze, Badiou, and Crockett affirm in their own ways, fundamentally political, even if, in the end, it cannot be reduced to its political determination. Crockett’s reading of Badiou in Chapter 6, then, presents the mathematical ontology of Being and Event as a “frozen ontology” (103). Crockett’s reading of the main features of Badiou’s ontology (or, more accurately, metaontology) is imprecise in places: for instance, he conflates being qua being and ontology (107), situation and structure (108), belonging and self-belonging (110) and at times confuses belonging and inclusion (118). Nevertheless, Crockett’s presentation of Badiou’s ontology as cold, austere, and static, which he further draws out in relating it to Kant’s notion of the mathematical sublime, seems absolutely correct to me. I’ll return to this point below. Crockett supplements this image of Badiou in Chapter 7, where he reads Theory of the Subject and Logics of Worlds in more dynamic terms. Crockett notes that the logic in these two works, which has less to do with being than the appearance of subjects and truths, brings Badiou closer to Deleuze. But for Crockett, even in these works Badiou’s philosophy remains too formal. Crockett’s estimation is perhaps best summed up in the following quotation, in which he discusses Badiou’s notion of life: “This is a grand and sweeping vision, but it is also austere and stoic. Badiou ends up affirming life in a way analogous to Deleuze’s affirmation of life, except that for Badiou, life, like an event, is extremely rare” (139). In Chapters 8, 9, and 10, Crockett puts his critique of Badiou and reading of Deleuze to more constructive, political use. Against the stasis and reductionism of Badiou’s mathematical ontology, Chapter 8 puts Deleuze’s ontology into dialogue with theoretical physics to develop a notion of being as “energy transformation” (145). Crockett’s reading of Deleuze along these lines provides a resource for speculating on new forms of nuclear energy production, based on “athermal and magneto-electric principles” (161). Crockett’s proposal, informed by his collaboration with architect and independent researcher Kevin Mequet, is worked out in more detail in his recently published Religion, Politics, and the Earth, co-authored with Jeffrey W. Robbins. Chapter 9 carries insights gained through the discussion of being as energy transformation onto political terrain, to develop a politics of the event. Although it is common to claim that Deleuze retreated from political concerns in his late work, Crockett argues that the time-image from Cinema 2 is a revolutionary political notion. Specifically, the time-image allows us to think politics beyond movement and territory—beyond the state-form—toward a notion of time “that stitches together humanity and world in an ethic or faith that is postcapitalist” (181). Crockett’s political vision, here, is not in the grand style of the old revolutions, of which he accuses Badiou of maintaining. It is, rather, insurrectionary, based on the transformative and explosive power of being as event. Chapter 10 gives theological-political body to this vision, discussing the notion of the time-image in relation to Haiti, Vodou, and democracy. For Crockett “the forces of Vodou” do not represent “another realm of spiritual forces,” but are best viewed as “links with which to refashion the world and our belief in it” (193). That is, these forces compose a time-image, a time-image that merits consideration because it has been and is in effect. Crockett’s book makes a number of significant contributions to contemporary discussions. Two deserve specific mention. First, Crockett’s reading of Deleuze’s time-image in relation to his other philosophical notions provides an important corrective to aestheticizing readings of Deleuze’s later work. The importance of the time-image is evident in Crockett’s own constructive work, where he mobilizes it in relation to energy, the politics of the event, and economics. Second, Crockett’s discussion of Hatian Vodou, although short, is especially suggestive, and I hope that he develops some of the themes present here in more detail in the future. At a more general level, Crockett’s discussion of Vodou is significant because it takes political theology into a new terrain, one not completely determined by traditional, often Christian, concerns. I suspect, however, that more sympathetic readers of Badiou will be less taken with Crockett’s book. So much is already evident in Roffe’s review, which I mentioned above, but I’m fairly certain that it will provoke a similar reaction among Badiouians. I myself am largely sympathetic to Badiou’s project, and take issue with certain aspects of Crockett’s portrayal of the latter. But I take Crockett’s polemical reading of Badiou as a provocation to state more clearly why Badiou is important in the present, beyond Deleuze. Crockett contends that Badiou’s mathematical ontology and formalism freezes being, draining it of its energy, its life. I think Crockett’s reading at a general level is spot on, so for me the question is to show why the freezing of being is important. Although I can’t go into detail here, briefly stated, when applied, what Badiou’s mathematical-ontological mediations allow us to do is to put a measure on being, to determine how a situation or world is organized so as to determine how to force an event. Being is certainly dynamic, as Crockett suggests, and I don’t think Badiou would really disagree, at least at a certain level. Yet sometimes we also have to know how to simplify the world, as Badiou states in Theory of the Subject, in order to force its change, and it’s this that Badiou offers. I’d like to think that, in the end, it’s not a matter of choosing sides, but of seeing both Badiou and Deleuze together in a type of “Deleuzian AND” (11) that Crockett celebrates. Despite Crockett’s charged and critical reading of Badiou and elevation of Deleuze, this book is an important contribution to that discussion. BIO: Hollis Phelps is Assistant Professor of Religion at Mount Olive College, Mount Olive, NC. He is the author of Alain Badiou: Between Theology and Anti-Theology (Acumen Publishing, 2013).